Sour Diesel aka Sour D, is a pungent sativa-dominant strain named after its sharp lemon and diesel-like aroma. This fast-acting strain is known to deliver energy and provide a dreamy cerebral effect. If you haven’t heard of this strain, someone you know has already tried it (and it’s legendary). Intoxicating and seductive. Diesel fuel and ripe lemons and earthiness, all at a full and unmissable level of stench. And above all: pungent, pungent, and more pungent. 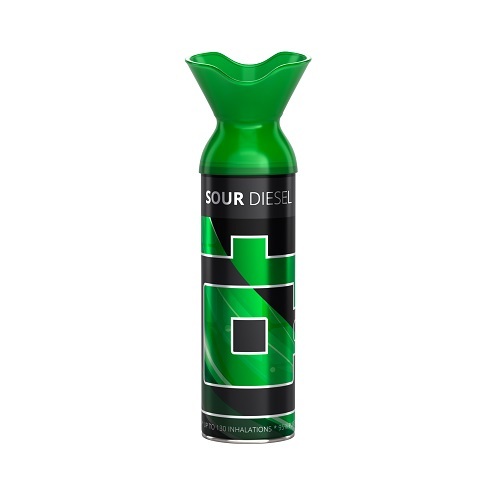 Few words better capture the extremely popular assault on the senses that have made Sour Diesel an enormous hit since the Nineties. But breakthrough research on the medical value of cannabis is revealing additional benefits to the Sour Diesel sucker-punch. The late 2010’s have seen the cannabis community expand its appreciation for weed beyond THC. Science and technology have unveiled additional value points in weed, with one compound in particular taking up the spotlight at the moment: terpenes. Terpenes are fragrant oils that lend cannabis its aromatic fullness and range. These fragrant oils are produced in a flower’s sticky resin glands, the same components that secrete THC, CBD, and other cannabinoids. It’s critical to also keep in mind that terpenes are not at all unique to cannabis. Indeed, they can be found in an array of other herbs, fruits, and plants beyond Mary Jane. Humulene is found naturally in clove, basil, and hops. (Yes, Sour Diesel and your favorite craft beer share something scientifically in common.) This terpene imparts a delicately earthy, woodsy fragrance, alongside spicy herbal notes hearty connoisseurs can peg in some of their favorite strains. Though weed is commonly associated with appetite stimulation, humulene is actually known to suppress hunger. Sweet basil, mangos (don’t forget this one! ), lemon grass, bay, thyme and parsley: all of these boast worthwhile quantities of myrcene. More than almost any other terpene, myrcene has been associated with “the entourage effect” in weed science. This is a synergistic experience that occurs because the terpene enhances the impact of other cannabinoids to the effect of creating a compound greater, and more enjoyable, than the sum of its parts alone. At some point in the story of humankind, a rumor came about linking the consumption of mangoes to a heightening of THC’s potency. Seemingly out of touch with reality, this comparison is actually all too true. Eat a juicy mango about an hour before you indulge in Sour Diesel and you’ll be off to the weed races. Finally, pinene shows up in Sour Diesel as well. Pinene makes itself known with a noticeably scent, and cannabis strains featuring pinene, like Sour Diesel, are known for helping to improve memory retention and alertness. This terpene also improves medical issues like inflammation and breathing issues like asthma. Like all terpenes, pinene is not limited to any particular strain. It’s commonly found in pine needles, conifers, and sage. Love Sour Diesel’s “couch-lock” free, mentally invigorating experience? Please comment below on how you feel these terpenes have accentuated everything you love about this kick-in-the-pants strain.